We are rapidly entering the next wave of business transformation in an increasingly data-centric world, yet many employers and job seekers are unprepared to navigate this new analytics economy. The growth and acceleration of data analytics calls for an updated workforce strategy, one that addresses the widening skills gap preventing employees from making strategic, data-driven decisions. To better understand the root of this skills gap, Qlik recently conducted a survey that found some eye-opening results. In the US alone, 76 percent of employees claim to work with a higher volume of data today compared to three years ago, yet only 33 percent of those in the workforce feel confident in their own data literacy skills. How can organizations take responsibility for bridging the gap? How can they empower the two-thirds of the workforce who feel they lack the ability to read, work with, analyze, and argue with data? What does this process look like? For employers, the first step is establishing a culture rooted in data literacy. Employees within an organization should have both the access and opportunity to succeed with data, from junior-level staff to the C-suite. A commitment to data literacy must start at the top, with leadership actively integrating data into their daily work and cultures. This also means equipping all employees with the right training and resources so they’re confident working with data and asking the right questions to create actionable insights. 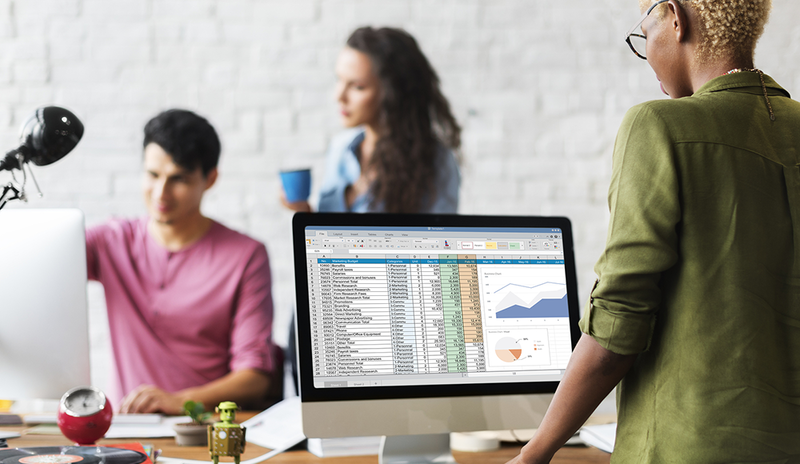 While some employees don’t work with data as frequently as others, cultivating a data-literate culture will weave analytics skills and concepts throughout all aspects of the organization. Establishing this culture in a thoughtful and programmatic manner accommodates various learning curves. It also creates accountability and upskill opportunities so that every employee is prepared for the future. For example, according to our study, middle and senior managers in the US are less likely to be data-literate in comparison to directors and C-suite executives, despite using data more times per week in their positions. Furthermore, creating a company-wide data-literate culture also enables all employees to speak the language of data, so that meaningful conversations can occur throughout the organization at any level. The data skills inconsistencies across levels of management can be problematic for organizations both now and in the long term. As the ongoing data revolution continually transforms roles, employees need to quickly execute new tasks and practice new skills. In our survey, we found that junior-level employees at early-career pivot points are among those least confident in completing data-oriented tasks, which highlights the need for academic institutions to step in when it comes to data literacy education and training. Young professionals now entering the workforce will lead the next generation into this analytics economy, so it is critical that they have a strong foundation from which to work. While it’s the responsibility of schools and universities to lead the way for these students, new pros and job seekers at any stage in their careers can also hold themselves accountable for closing the skills gap. To fill skills gaps in their own lives, job seekers can actively seek out programs, courses, or hands-on experiences that will help develop their data literacy skills. Once someone strengthens these data literacy skills, in what way will their capacity to support their team improve? It starts with being able to ask the right questions and identifying new pieces of insight from data sets, but it goes beyond that. The real benefit lies in being able to tell a story with the organization’s data to better understand its unique role in the market, its potential, and its future trajectory. Enabling employees across all levels and facets of a company to tell these stories can transform decision-making processes. When an entire organization is empowered, thoughtful insights drive continuous digital transformations for employees, customers, and partners alike. Jordan Morrow is the global head of data literacy at Qlik. Jordan Morrow is the global head of data literacy at Qlik, helping individuals and organizations realize their data and analytics potential by bringing light and enhancing skills in data literacy. When not found within data and analytics, Jordan can be found with family or trail-running the mountains of Utah.